Commander John Robert Francis Wild, CBE, FRGS (10 April 1873 – 19 August 1939), known as Frank Wild, was an explorer. He went on five expeditions to Antarctica for which he was awarded the Polar Medal with four bars, one of only two men to be so honoured, the other being Ernest Joyce. Frank Wild was born in Skelton-in-Cleveland, North Riding of Yorkshire, the eldest of eight sons and three daughters born to schoolteacher Benjamin Wild and his seamstress wife Mary (née Cook). The family came from Skelton close to Marton, birthplace of Captain James Cook, to whom the family claimed ancestry through Mrs Wild. Her father was Robert Cook, who claimed to be a grandson of the great explorer. By 1875 the Wild family had moved from Skelton to Stickford in Lincolnshire, and in late 1880 moved again to Wheldrake near York. Wild's family next moved to the village of Eversholt in Bedfordshire. Here his father was appointed clerk of the Eversholt Parochial Charity at Woburn. Frank Wild was educated at Bedford. 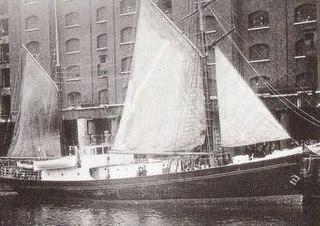 He joined the Merchant Navy in 1889 at the age of 16, receiving his early training in sail in the clipper ship Sobraon. In the Merchant Navy he rose to the rank of second officer. In 1900, aged 26, he joined the Royal Navy. The 1901 census shows that at that time he was serving as an Able seaman aged 27 on HMS Edinburgh, anchored in Sheerness Harbour. In 1901 he was a member of Robert Falcon Scott's crew as an Able seaman on the Discovery, along with Ernest Shackleton who was then a sub-lieutenant. He was with Shackleton on the Nimrod Expedition 1908–1909 and was a member of the team that crossed the Ross Barrier and Beardmore Glacier at a record latitude of 88º23'S. In 1911 he joined Douglas Mawson's Aurora expedition and was in charge of the western base on the Shackleton Ice Shelf. He served as Shackleton's second-in-command on Shackleton's Imperial Trans-Antarctic Expedition (1914–1916). On returning to the United Kingdom in 1916, Wild volunteered for duty during World War I and was made a temporary lieutenant in the Royal Naval Volunteer Reserve. After taking a Russian language course, Wild became the Royal Navy's transport officer at Archangel, where he superintended the war materials which arrived during the Allied intervention in Russia. After the war, Wild went to South Africa where he farmed in British Nyasaland with Francis Bickerton and James McIlroy, two former Antarctic comrades. From 1921 to 1922 Wild was second-in-command of the Shackleton–Rowett Expedition, a poorly equipped expedition with no clear plan, and a small ship, the Quest. Shackleton died of a heart attack on South Georgia during the expedition, and Wild took over command and completed the journey, combating unfavourable weather to Elephant Island and along the Antarctic coast. Frank Wild's younger brother Ernest Wild also went on to become a Royal Naval seaman and Antarctic explorer, receiving a Polar Medal. On 24 October 1922 Frank Wild married Vera Alexandra Altman (née Bogosoff), the widow of a tea planter of Borneo, at Reading Registry Office. They had first met in 1918 when Wild was serving in Russia, and he had assisted her to obtain a passage home to England. After the Shackleton–Rowett Expedition Wild returned to South Africa with Vera where he continued to farm. He bought some land in the Mkuzi valley in Zululand where he tried to grow cotton. The enterprise was a financial disaster and after five years of drought followed by flood, Wild gave up. Next he was involved in railway construction and for a time had some success with a contract to extend the South African railway to the border with Swaziland. However, the contract ended and he was forced to seek employment elsewhere. Wild's marriage to Vera was in difficulty shortly after arriving in Zululand and she asked for a divorce, which became absolute on 27 December 1928. Next, Wild took a temporary job as a hotel barman at Gollel in Swaziland which was owned by a friend of his. Caught in the 1930 Depression, he was forced to move from job to job, including working as a battery manager at a diamond mine which went bankrupt, prospecting in Rhodesia and managing a quarry. He subsidised his meagre income by giving the occasional lecture on the Endurance expedition. He married for the second time on 18 March 1931. His new wife, Beatrice (Trixie) Lydia Rhys Rowbotham, was 47 years old and ten years his junior. They settled in Germiston where in 1932 he worked supervising a stone-crushing machine at a Witwatersrand gold mine. Very happily married, the following four years saw relative peace and calm and Wild earned enough money not only to buy a car (a Wolseley) but to take two well needed holidays in the hinterland and coast of South Africa. Due to ill health he was forced to leave the mining job and he was given a job by his brother-in-law Pat O'Brien Frost to oversee the building of Frost's house in Haenertsburg in the Eastern Transvaal. However, he had little respect for Frost; that and the demands of building the house in an extremely remote part of the country caused him to return to Johannesburg. By now he was in poor health but retained his characteristic kind, calm countenance. With the offer of a job as a store-keeper on the Babrosco Mine near Klerksdorp from his friend Jack Scott, the mining magnate, he and Trixie finally found the peace they were seeking. He had also been awarded the Civil List pension from Downing Street. Frank Wild died of pneumonia and diabetes in Klerksdorp on 19 August 1939, aged 66 years. He was cremated on 23 August 1939 at the Braamfontein Cemetery in Johannesburg. Wild was awarded the CBE in the New Year Honours List of 1920 and in May 1923 he was made a Freeman of the City of London. He was also the recipient of a number of awards for his contributions to exploration and for advancing geography: He received the Royal Geographical Society's Back Award in 1916 and the Society's Patron's Medal in 1924. Cape Wild and Point Wild on Elephant Island in the Antarctic are named after him, as is Mount Wild in the Queen Alexandra Range and Mount Wild in Graham Land. His CBE and four-bar Polar Medal sold for £132,000 in September 2009, more than double the estimate. On 27 November 2011 the ashes of Frank Wild, Shackleton's "right-hand man", were interred on the right-hand side of Shackleton's grave site in Grytviken, South Georgia; the ashes had previously been found in the vault of Braamfontein Cemetery, Johannesburg, by journalist and author Angie Butler while researching a book. The inscription on the rough-hewn granite block set to mark the spot reads "Frank Wild 1873–1939, Shackleton's right-hand man." Wild's relatives and Shackleton's granddaughter, the Hon. Alexandra Shackleton, attended a service conducted by the Rev Dr Richard Hines, rector of the Falkland Islands. Butler said, "His ashes will now be where they were always supposed to be. It just took them a long time getting there." The journey to South Georgia, the service and the interment were the subject of a BBC Radio 4 programme in the Crossing Continents series. On 25 November 2011 the Government of South Georgia and South Sandwich Islands issued a set of commemorative postage stamps honouring Frank Wild along with other Antarctic pioneers. The set comprises eight stamps in four se-tenant pairs with denominations of 60, 70 and 90 pence, and £1.15. They are available from the Falkland Islands Philatelic Bureau. 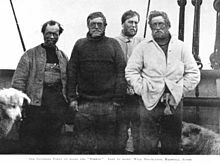 In April 2012 BBC2 broadcast "Frank Wild: Antarctica's Forgotten Hero", presented by Paul Rose, which placed Wild's achievements alongside those of Shackleton and the other explorers of the Heroic Age. The documentary film also featured commentary from polar historian Dr. Huw Lewis-Jones, author Francis Spufford and explorer Sir Ranulph Fiennes. Of Wild, Paul Rose has said: "He was a true great. He stood shoulder to shoulder with Shackleton. They made the perfect team. With Shackleton’s great leadership skills, and Frank’s cool head and experience, they were able to handle almost anything that the Antarctic could throw at them." On 29 September 2016, a statue of Wild was unveiled in his hometown of Skelton-in-Cleveland. ^ a b c Glenn M. Stein, FRGS (15 September 2012). "Antarctic Medals – Frank Wild's Medals". The Antarctic Medals website. Retrieved 6 May 2013. ^ a b Bickel 2001, p. 27. ^ Nature Obit, 30 September 1939. ^ Paul Ward. "Frank Wild (1873–1939) – Biographical Notes". Cool Antarctica. Retrieved 6 May 2013. ^ Telegraph, Forgotten hero, 8 December 2011. ^ "Could polar hero Wild have saved Captain Scott's life?". BBC News. 19 April 2012. Retrieved 6 May 2013. ^ "Frank Wild: Antarctica's Forgotten Hero". BBC. Retrieved 6 May 2013. Bickel, Lennard (2001). Shackleton's Lost Men. London: Random House. ISBN 978-0-7126-6807-1. Lansing, Alfred (1959). Endurance, Shackleton's Incredible Voyage. Huw Lewis-Jones (2009). Face to Face: Polar Portraits. Conway and Polarworld, 288 pages. ISBN 978-1-84486-099-9. Leif Mills (1999). Frank Wild. Caedmon of Whitby, 350 pages. Angie Butler (2011). "The Quest for Frank WIld". Jackleberry Press, 214 pages. Huw Lewis-Jones and Kari Herbert (2011). In Search of the South Pole. Conway, 192 pages. ISBN 978-1-84486-137-8. Naidoo, Romaana (20 October 2011). "Wild's ashes found in Joburg". joburg.org.za. City of Johannesburg. Retrieved 10 December 2011. Marr, James W. S. (30 September 1939). "Commander F. Wild, C.B.E.". Nature. 144 (3648): 578–579. doi:10.1038/144578b0. Lusher, Adam (27 November 2011). "Forgotten hero Frank Wild of Antarctic exploration finally laid to rest, beside his 'boss' Sir Ernest Shackleton". The Daily Telegraph. Retrieved 10 December 2011. Wikimedia Commons has media related to Frank Wild. Charles Green, also known as Charlie Green, was a British ship's cook, who took part in Sir Ernest Shackleton's Imperial Trans-Antarctic Expedition as the cook for the Weddell sea party on board the Endurance. The son of a master baker, Charles learnt to bake, but ran away at the age of 22 to join the Merchant Navy. Whilst in Buenos Aires on board the Andes in October 1914, he heard word that Shackleton had fired the expedition's cook, for drunkenness, and was subsequently hired.